About 30 people were injured Friday when a Northwest Airlines flight suffered turbulence before landing at Japan’s Narita International Airport, a Northwest spokesman said. Three people where seriously injured, fire officials said. 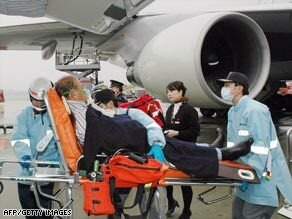 Tokyo ‘s Kyodo news agency later put the number of overall injured at 47. There were 408 passengers and 14 crew members on the Boeing 747-400 flight from Manila, Philippines . American passenger Vincent Salazar told Kyodo News that he heard screams around 30 minutes before the plane was scheduled to arrive as it suddenly fell, then ascended. Salazar added that several passengers were thrown into the cabin ceiling, hitting their heads and hurting their necks because they were not wearing their seatbelts. ”We were flying and then the seatbelt sign came on and when we were trying to get back to the seats, the plane dropped and so some people went up and hit the top (ceiling),” he told the agency. ”I actually was pretty calm because I’ve flown a lot, but the lady next to me was screaming… And unfortunately some people weren’t in their seatbelts. They were just flying.” The plane eventually touched down east of Tokyo at Narita airport at around 12:20 p.m. Friday, the agency quoted the Land, Infrastructure, Transport and Tourism Ministry as saying. Those injured during the incident were taken to nearby hospitals, the airport’s operator and fire department officials told Kyodo. Turbulence is air movement that normally cannot be seen. It may occur when the sky appears to be clear and can happen unexpectedly. Most injuries result from passengers who are not belted into their seats. It can be created by any number of different conditions, including atmospheric pressures, jet streams, mountain waves, cold or warm fronts, or thunderstorms.